A very quick entry, mainly as we don’t have much on it just yet. But Jason Kelk flags up to GTW that a 3rd Mastertronic Loader game was created but unused. Apparently Chris Young, who was on work experience at Mastertronic at the time, said that the game got messed up at the mastering factory and as a result was never used. When we asked Richard Aplin about the game, he couldn’t recall anything about it. And the reason why, was because it was done by a different developer. The long lost 3rd loaded was to be “Munch Load”, which was produced by John N.W Cheeseman (or John Cheesman). 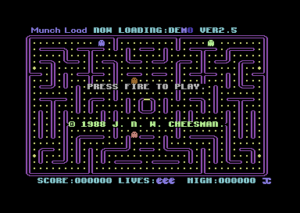 Munch Load was actually a game which was written to go along with a new loader called “Cheeseloader”. 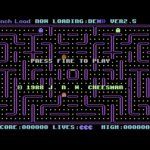 It’s a simple game as you might expect, but very playable and would have been enjoyed for sure by tape gamers. The game itself got leaked however in 1994 through dodgy means, which can be read about in the note files in the download here. It’s an interesting story, but essentially the game was leaked from a demo disk that was sent to Ocean by John. Leaked by similar means then to how Plotting was leaked. Hopefully some day we may hear more from John himself about the loader and the game. But for now, check it out and the interesting back story!